I have been so unsure of how to plan the bathroom layout for our new addition we are planning for the current attic space upstairs, until I saw these photos that is. I love how they maximized the height of the space by adding a a cool vault that would be a plus in any popular modern bathroom designs and that follows the roof line rather than trying to hide the architectural details of their home. I definitely want to structure our space in the same way and keep everything bright and neutral like they did. Another key to their success was adding a lot of master bathroom ideas that incorporate lighting elements. The OCD person in me that loves symmetry and geometry is absolutely loving this modern bathroom layout. I want to keep our bathroom remodel cost low so I thought I would start with the most simple boxy shape possible so that I would not need to buy custom pieces. These photos are a great starting point for what I am envisioning because I can buy simple "off the shelf" vanities from our local Lowes, some sleek glass shower doors and a nice white tile to complete the look. 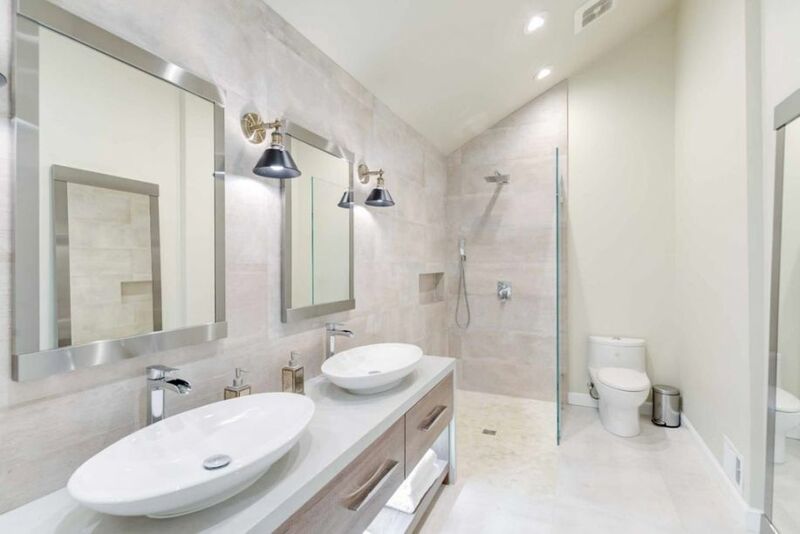 There is no need for any fancy custom vanities or intricate tile detail when you have an easy master bathroom layout like this with clean lines and an effortless modern style. I can't wait to post some follow-up photos of our new space. One day when we finish our new house I hope to a have a bathroom layout that looks like this -- bright and open, full of luxurious touches. Even though I enjoy a lavish space, I still want to have simple bathroom designs with an intuitive layout and very limited clutter. I like how this particular space is completely open with the main features like the shower, vanity and tub are all placed around the perimeter. This allows plenty of space for traffic flow in the center and maintains the open and spacious feel. From now on this inspiration room is definitely going to be my go to for bathroom layout ideas as I begin planning our new home design. For some reason I have hit such a mental wall trying to plan out our new bathroom layout for our renovations we are completing in the master suite of our current home. 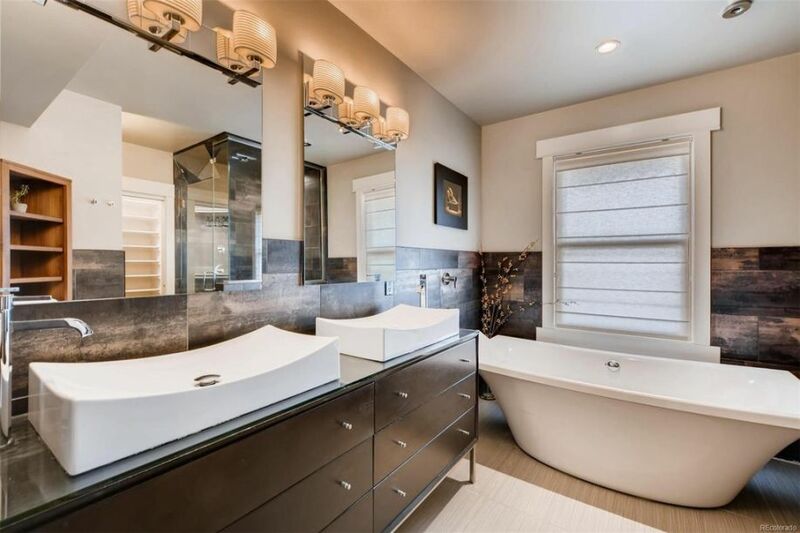 We have a large square space similar to the home in these photos, but our key structural elements like the shower, bathtub and vanity are placed sporadically around rather than in a clean simple line like these bathroom floor plans. I really like how all of the "water features" are on one wall and that both have windows inside of them. It makes the room feel more open and streamlines, something that our home currently lacks in a big way. I definitely want to translate these bathroom ideas into our new blueprints and speak with our plumber to see if we could move things around to imitate this look. We we first took on this master suite remodel, we were not quite sure how we were going to fit everything that the homeowners requested into their fairly limited bathroom layout. Adding double vanities, a soaking tub, large walk in shower, and water closet was a tall order in the small rectangular floor plan that we walked in to. However, as always we wanted to deliver exactly what our clients asked for so we put our heads together trying to figure out bathroom designs for small spaces that would be able to fit everything we needed to. We decided that our best bet would be to just embrace the small size and line everything up right next to each other but in a color palette that was perfectly coordinated. I must say, I am so proud of myself for making the most out of this awkward bathroom layout that our new home has. 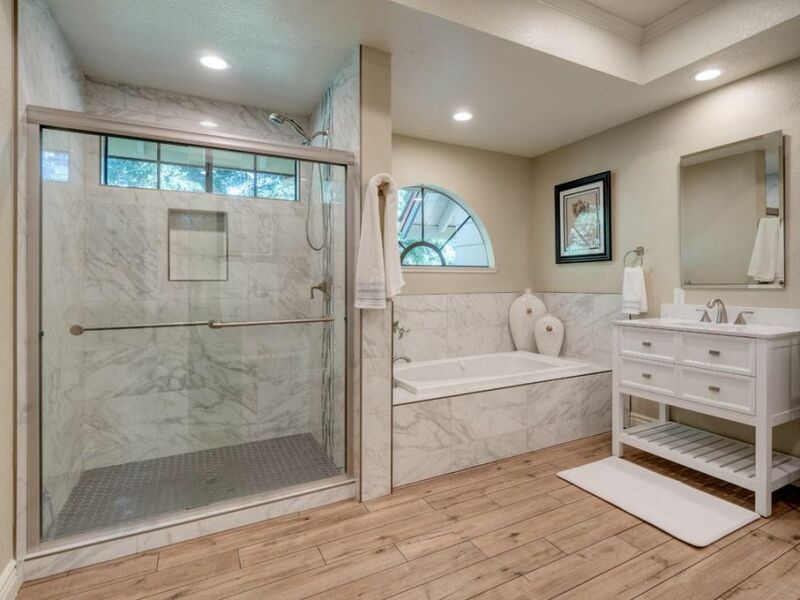 As you can see we have a long hall way with a very large oddly placed shower right at the entrance which made it very hard to use most of the modern bathroom ideas that I had bookmarked over the past few years of us house hunting. I love sleek looks with clean lines and minimal furnishings, so a floor plan of this type really threw me for a loop. I decided to just go for it and create a very spa-like feel that I have seen in a lot of luxury bathrooms in 5 star hotels we have stayed at over the years. 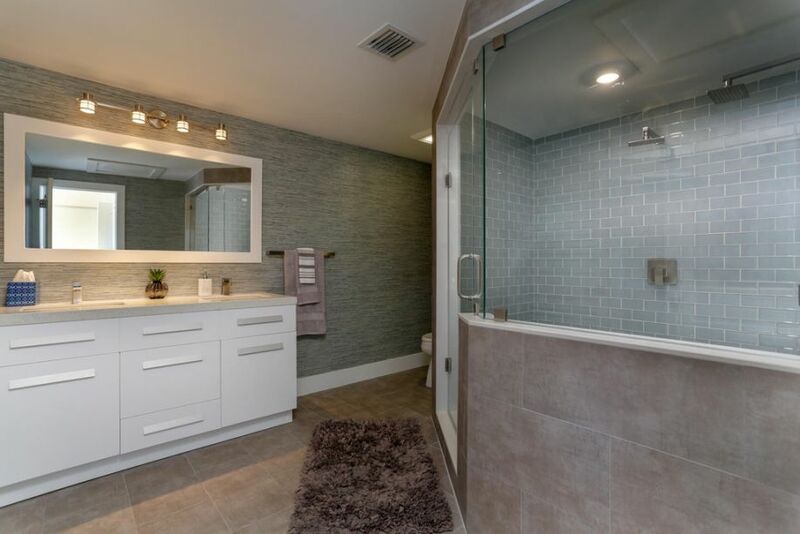 Rather than hide the large shower, I covered it in the same tile as the floor and accented the interior with glass subway tile that ties together with the teal basketweave wallpaper I selected for the rest of the walls.